CoreX is a specialised regulatory service provider in the Health Care environment. We support companies with regulatory services in the context of Marketing Authorisation Applications or Post-Approval Applications at European Health Authorities. The focus of our services is on the set up and management of labelling documents for medicinal products in English and all EU/EEA languages required by European Regulations. 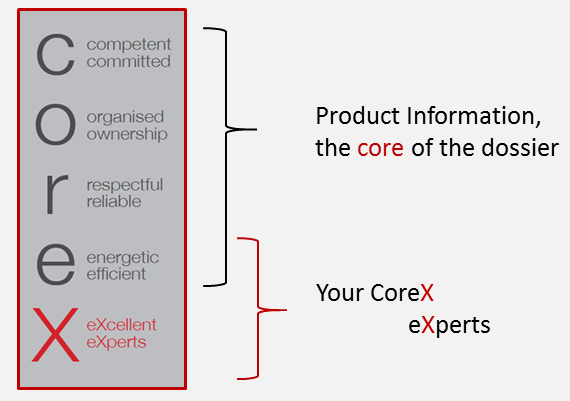 CoreX relies on the expertise of the company’s core team, with in total more than 50 years of relevant experience, gained as consultants, in industry and at a Health Authority. CoreX provides a comprehensive “one-stop-shopping” labelling package that starts with support for the English Product Information and ends with the submission of the final agreed language versions to the Authorities. As our service includes the management of the whole labelling process, CoreX involvement will provide added value in terms of regulatory and strategic expertise, additional resources and procedural experience (up to established contacts to Health Authority reviewers) to run the linguistic review process smoothly and within the tight timelines defined by the Authorities. ...thus, our service goes far beyond the provision of the required translations.